Industry Experts, Inc. published the new global market research report “Microfluidics – A Global Market Overview“. As per the new report, the global market for microfluidics is forecast to touch US$4.2 billion in 2018 with Hospitals estimated the largest end-use sector with US$1.8 billion in the same year. Microfluidics can be described as the manipulation and analysis of minute volumes of fluid and has evolved over the past three decades into a powerful technology with a number of established and relevant applications within the biological sciences. The research and development conducted over the years in this unique technology has yielded an abundance of techniques that enhance biological assays through the miniaturization of existing methods, in addition to developing innovative analytical approaches. Growing demand for microfluidics technology based point of care devices and kits is the key factor propelling overall growth of microfluidics. Devices for PoC diagnostics have a large number of applications in the areas of genomics and proteomics and enable in identifying the DNAs of microbes implicated in several diseases. Due their size, disposability and integration of complex functions, PoC devices can be utilized in a variety of settings, including bedside, hospitals, delivery rooms, intensive care units, doctor’s offices, emergency rooms, pharmacies, homes for self-testing and even in space. In terms of applications market, PoC Diagnostics is projected the fastest growing area with a CAGR of 19.2% and is also estimated the largest consumer of microfluidics estimated at US$1.6 billion in 2017 and expected to touch US$4.5 billion in 2023. 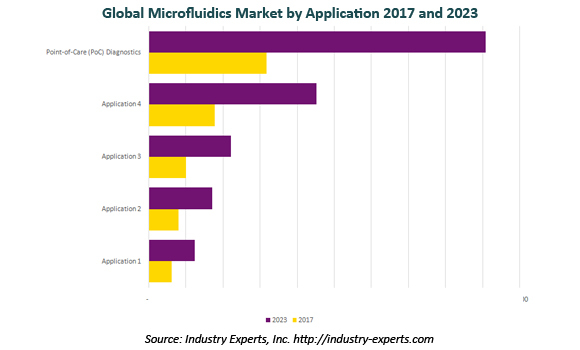 This comprehensive market report reviews, analyses and projects the microfluidics market for the period 2014-2023 globally, and the regional markets including North America, Europe, Asia-Pacific and Rest of World in terms of USD. These regional markets further analyzed for 11 independent countries across North America – The United States, Canada and Mexico; Europe – France, Germany, Italy and The United Kingdom; Asia-Pacific – China, India, Japan and South Korea. The report analyzes the Microfluidics market in the above regions by major country, component, material, key application and by major end-use sectors. Global markets for microfluidics components analyzed in this study include Microfluidic Chips, Microneedles and Micropumps while material types studied comprise Glass, Polymers, Silicon and Others. The report explores the major applications of microfluidics including Agro-Food Testing, Drug Delivery, Drug Discovery, Life Science Research and Point-of-Care (PoC) Diagnostics. The key end-use sectors analyzed in this report include Academic & Research Institutes, Diagnostic Laboratories, Homecare Settings and Hospitals. This study includes 258 charts (includes a data table and graphical representation for each table), supported with meaningful and easy to understand graphical presentation, of market numbers. The report profiles 23 key global players and 31 major players across North America – 19; Europe – 11; and Asia-Pacific – 1. The research also provides the listing of the companies engaged in microfluidics industry. The global list of companies covers the address, contact numbers and the website addresses of 600 companies.